The campaign to roll back the high parking fee increase got off to a rousing start on Tuesday when more than 120 people (in summer when most faculty and students aren’t around!) demonstrated at the residence hall ribbon cutting. We were prevented from entering with our signs, but they certainly knew we were there (see here). The university has informed us that for the new West Garage, you will have to pay higher ‘interim parking rates’ of $15/day. We will be filing charges at the Department of Labor Relations to prevent them from imposing these higher rates. We will let you know what happens. The FSU Executive Committee is committed to the FSU bargaining team arriving at one unified parking agreement with the CSU, PSU, and students. 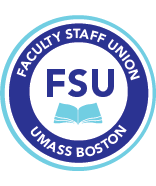 The FSU Executive Committee also pledges that the FSU Executive Committee, bargaining team, and members will actively participate in a campaign to reach an agreement that is beneficial to all the unions and students. Contact the FSU office if you wish to virtually attend tomorrow’s (Tuesday) contract information meeting from 10-11:30. For those who will be there in person, please note that there is a room change. The meeting will be in Healey Library, LL, Presentation Room 2, not Presentation Room 3.